coconut flour | Yikes! No Carbs Please! Things have been quiet on the kitchen front lately. We’ve been taking advantage of the fantastic weather and have been spending time in the beer gardens and with friends. It’s also the Easter holidays and we had a wonderful week in the Côte d’Or in Burgundy, France savouring good food and fine wines. It wasn’t easy going low carb and I tried to make ‘wise’ choices where possible. We rented a ‘gîte’ and I cooked a few times so, was able to keep things a little in check. Now that we’re back, I have to replenish my stock of staples. Just finished baking up a fresh batch of low carb Focaccia bread today and also had time to tinker around with a coconut muffin recipe I tried a couple of weeks ago. The recipe is from Healthy Indulgences. I had made some ‘Nutella’ using erythritol and stevia and it wasn’t sooo good and I wanted to get rid of it. 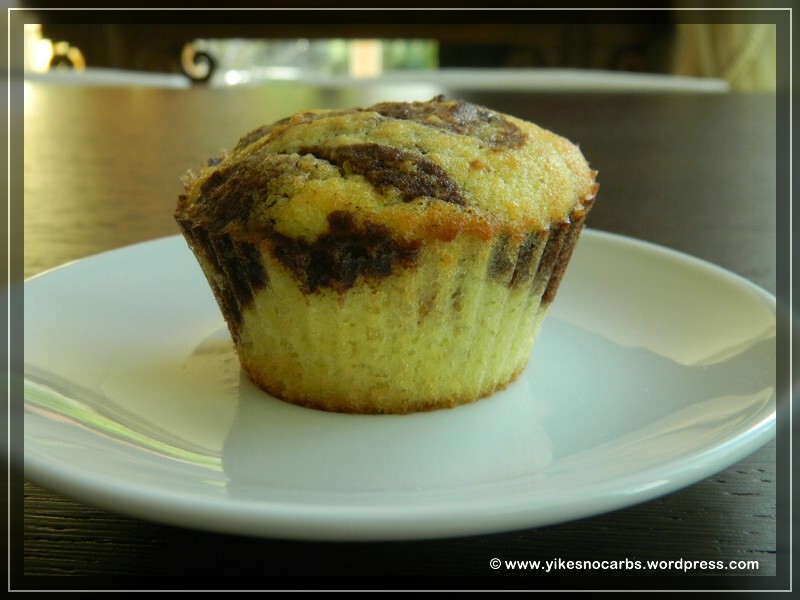 I found that Lauren had a muffin recipe using low sugar nutella and gave it a go with not too pleasing results. The batter stuck to my muffin liners. This happened with my bean cakes and I thought they stuck because of the beans. The week after I made these, I stumbled across some silicon muffin cases in the local supermarket and immediately grabbed a box. So today, I put them to use for the first time and decided to adapt the Nutella Swirl Cupcakes into Low Carb Marbled Coconut Muffins with very pleasing results! The batter does NOT stick to the muffin cases. Hurrah! These muffins have a slightly coconutty taste. I think I like these a little better than the ones made with beans but that could be because I’ve made so many cakes with beans, I’m sick of them. You’ll have to decide for yourself! Preheat oven to 175 degrees C or 350 degrees F. Get ready your silicon muffin cases or a silicon baking pan. If you don’t have either of these, line a baking pan with parchment paper like this. Mix coconut flour, erythritol, baking powder and salt together. Add oil, vanilla, milk, cream, liquid stevia and 5 egg yolks and mix well. Whip the egg whites with the cream of tartar till stiff peaks form. Fold the egg whites gently into the batter till well incorporated. Pour half the mixture into a clean bowl. Add the cocoa powder and 1 tbsp milk to one of the bowls and mix well. Spoon some white and chocolate mixture into each muffin case. Use a small spoon and give the batter in each case one or two swirls. If just using one pan, drop alternate spoonfuls of each coloured mixture into the pan and give it a couple of swirls. Bake muffins for 20-25 min or till a skewer poked in comes out clean. I haven’t baked the cake in a pan yet but judging from my other cakes, I would say between 50-60 min. If you bake a cake, check after 50 min. 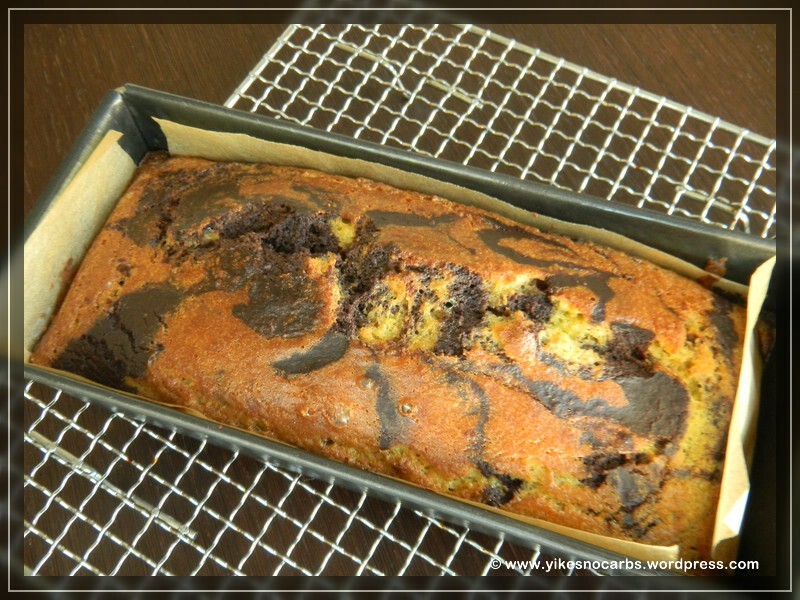 … a moist marble cake. This cake contains beans, coconut flour and almond flour but I haven’t called it Bean Coconut Almond Marble Cake because that’s a mouthful. Besides, you can’t taste the beans, coconut or the almonds. If you really pay attention, you will notice the light crunch of the coconut but it is minimal. 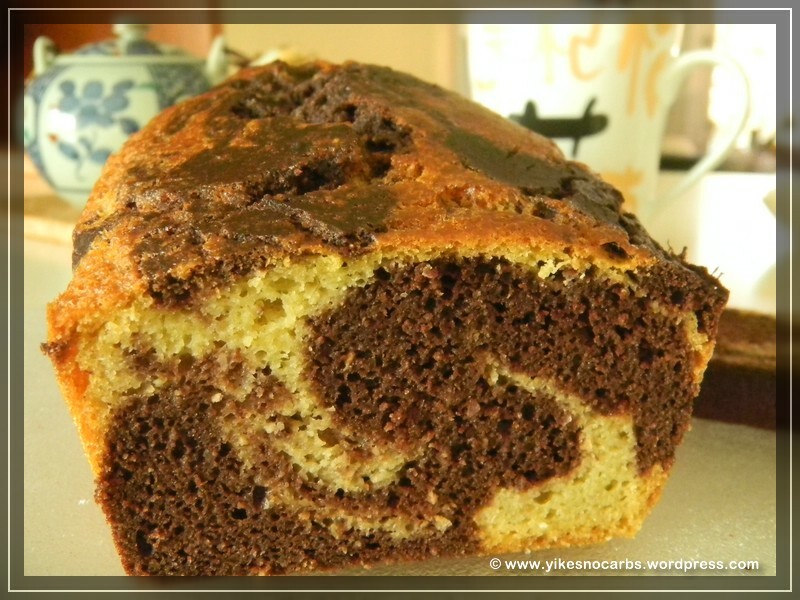 The intention here is not to make a cake where you can taste the main ingredients but rather to produce a cake without using flour which ressembles the version made with flour. I think this cake is a lot better than many I have eaten here in Germany which have been crumbly and dry. It isn’t sweet so if you’ve got a sweet tooth, then increase the erythritol. Alternatively, a nice chocolate ganache frosting will probably do the trick as well. In this recipe, beans replace the flour, namely white cannellini beans. In my experiments with beans, I found that it is not possible to substitute any type of bean freely as they have different consistencies when pureed. Some are drier than others. Sometimes it may work, sometimes not. If a bean substitution were made, it may be necessary to adjust the liquid in the recipe. I also found that beating the egg whites separately and folding them into the batter (as some cake recipes recommend to produce a lighter cake) does not make a great difference to the final cake so I have not made the cake this way. This recipe has become a staple in our family and the best part is we can eat a slice – no, more than one slice – without feeling guilty. Baking Tip: I have baked several bean cakes in the past weeks and as mentioned in an earlier post, bean batter sticks badly to non-stick pans – well, mine at least, despite generous buttering. If you use a silicone pan, you will not have this problem so if possible, go out and buy one. If you already have a lot of baking pans, then the best thing to do would be to line them. Here is how I lined my non-stick baking pan. Click on the photo for a close-up view. I should have taken a photo without the batter in the pan but forgot. The instructions follow below. Cut one piece of parchment paper wide enough to cover the width of the pan and long enough to cover the base and up both sides. Then cut another wide enough to cover the length of the pan, and again long enough to cover the base and sides. Butter the pan and ‘stick’ the parchment pieces onto the pan, one on top of the other – it doesn’t matter which goes in first. You will see that the corners are still left unlined. Just butter these areas well and bake your cake. When the cake is done, loosen the cake from the corners before turning it out of the pan. One more thing – how did I arrive at this recipe? Well, yes, through trial and error (lots of trial and error!) but I did not start from zero and pluck figures from the air. This final recipe was arrived at by adapting a recipe found at Healthy Indulgences Blogspot here. Since ingredients from different manufacturers and different countries react differently affecting taste and consistency, I have adapted it to produce the results I want using ingredients I am able to purchase here in Munich. I do hope that you will be able to achieve the same results. Do let me know how you do. Line your pan. Preheat your oven to 180 degrees Celsius or 350 degrees Fahrenheit. Rise beans well and place in a bowl. Add the eggs, erythritol, stevia, vanilla and salt. Puree everything till fine. Next add the coconut flour and almond meal, followed by the baking powder and baking soda. Mix well. Pour half the batter into another bowl and add the cocoa powder. Mix carefully till the cocoa powder is incorporated. Spoon half the white batter into your baking pan, half the chocolate batter, followed by the rest of the white and chocolate batter. Using a spoon, give the batter in the pan a couple of swirls. Pop the pan into the oven and bake for 55min or till cooked (do the skewer test – if no crumbs adhere to the skewer, it’s done). On 6 March I blogged about having my cake and being able to eat it. Unfortunately, I have been having my cake and eating it every day since then 😦 . I was so inspired by the Healthy Yellow Cupcake recipe that I decided to try making other cakes using beans. Luckily, eating one slice does not require much insulin so I have been indulging myself. I tried a lemon pound cake recipe I found on a blogger website using chickpeas. It was a total disaster. Not only did the cake fall to bits and pieces, it also had a chickpea taste. Had to bin the whole thing. Yes, yes, I know – if a cake is made of chickpeas, it should taste of chickpeas. But I’m not asking for the impossible here. I know: I want to use another ingredient and have it taste like something else. If you think of carrot cake or zucchini cake or the cupcake recipe above, it is possible! So lesson learnt quickly, I decided to play safe and go back to using white beans and to experiment on my own. In my review of the Healthy Yellow Cake recipe as well as the chocolate cake recipe I tried, I wrote that both cakes stuck to the muffin liners leading to quite a bit of cake wastage. Also, on the first and second day after baking, there was a slight aftertaste from either the baking soda, baking powder or erythritol and the cake was a bit salty. I found that all this disappeared after two days and therefore recommended waiting and also using a topping to mask the taste. Since then, I’ve been experimenting and today, I think I hit the jackpot with my lemon pound cake which I’d now like to share with you. No aftertaste, no need for topping, no need to wait 24 hours for the beany taste to disappear or 48 hours for the aftertaste mentioned above to disappear. This is a cake you can start eating as soon as it has cooled, on the day of baking and in comparison to ‘normal’ cakes, is still moist after 6-7 days left on the kitchen counter at room temperature. The room temperature in our home is around 21 degrees C. I don’t know what will happen in summer so it may be wise to put the cake into the refrigerator if you have space. I can’t tell if the cake will stay moist longer than 1 week as our cakes haven’t lasted longer than that. I do know that it is possible to freeze the cake without any problems. I think the successful outcome of any cake depends not only on the recipe but also very much on the brand of ingredients used. The recipe below came out perfect using the brands I bought and I hope that you will have success too! Take a close-up look at the texture of the cake. Need I say more? Before I give you the recipe, a tip about the baking pan. I noticed that all my baking attempts using beans stick badly. Whether I used paper muffin liners, a non-stick baking pan or generous buttering and even sprinkling the sides with almond meal, cakes made of beans seem to stick! However, the cake didn’t stick when I lined my pan with parchment paper! So make sure you line your pan with parchment. It is a bit of a pain to line the whole pan (base and 4 sides) with parchment so I did it the lazy way. I cut a piece that would cover both long sides and the base of the pan, buttered the pan generously and ‘stuck’ the parchment in place. That means that the two short sides were not lined but only buttered. After the cake was baked, I used a spatula to loosen the sides, the cake plopped out easily and the parchment peeled off nicely with no damage to the cake. So problem solved – cake wastage reduced. I have an idea but haven’t been able to test it out yet. Using a silicon pan may be the solution. If it works, then I would be able to make muffins because right now, I think muffins create too much wastage. 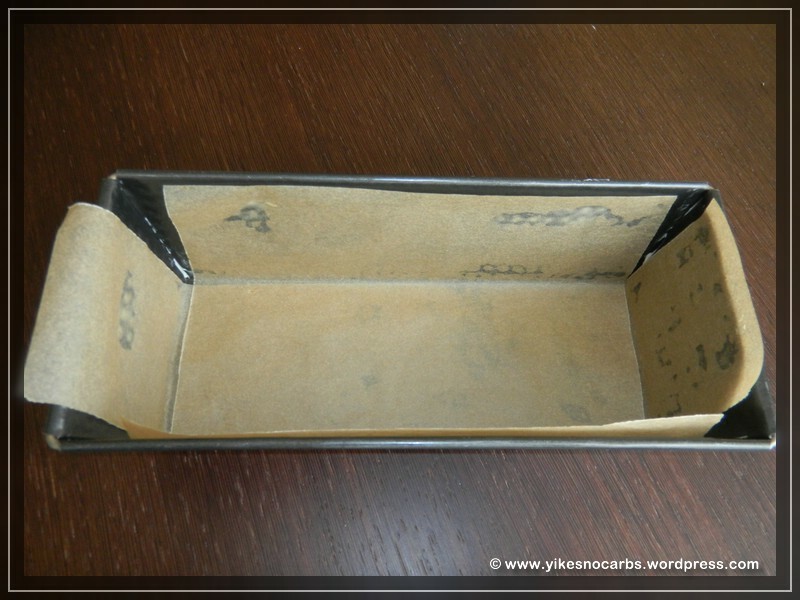 Update – 5 Oct. 2011 – A silicon pan does work much, much better. If you have a silicon pan, forget the parchment. Another tip – once you’ve added your baking powder and baking soda, don’t wait too long before putting the baking pan into the oven. The baking soda will start working and you don’t want the bubbles to deflate. Note: if your stevia is dark brown, this may lead to a slight discolouration of your cake which in no way affects the taste. If this bothers you, add the walnuts so it will look like the discolouration comes from the walnuts! Preheat oven to 180 degrees C (350 degrees Fahrenheit). Line your baking tin. Drain and rinse beans well. Puree with eggs, vanilla, salt and stevia. Beat butter till soft. Add erythritol (I usually stir to mix a little before beating as I have a hand-mixer and bits tend to fly all over the place) and beat till well mixed. Add the bean mixture in two batches and mix again till smooth. Next add the coconut flour, almond meal, lemon zest, baking powder and baking soda. After mixing well, pour into pan, tap it on the table counter to level off the batter in the pan and bake it for 50 minutes. While the cake is baking, prepare the syrup. Squeeze your lemon, measure 1/4 cup and add the erythritol. Check and adjust sweetness. Test the cake for doneness with a skewer after 50 min. and bake longer if necessary. The top of the cake will take on a lovely brown hue. Remove the pan from the oven and poke lots of holes in the cake close to each other with a skewer. Drizzle the syrup all over the cake and leave it to cool. If you have omitted the walnuts and slice your cake into 20 slices, then each slice has 2.9gr net carbs!! If using walnuts, then add 0.4 gr carbs per slice. I can have my cake and eat it! Yes, I can finally eat cake without feeling guilty and having to inject more insulin than I want! Thanks to Lauren of Healthy Indulgences, I have found two cakes for the low carb diet. Since I am now equipped with coconut flour and erythritol, I tried out two of her recipes – her Gluten-free Low Carb Yellow Cake and her Healthy Chocolate Cake. About a week has gone by now since I’ve tried these recipes. I made both cakes into muffins with differing success rates and I’ll explain why further on. Both cakes use beans – yes, BEANS! I’ve made muffins and cakes with carrots and zucchini and know about the uses of pumpkin but beans? This never crossed my mind. After baking these, I’ve been googling other beans and guess what? Beans are a very versatile ingredient. I found recipes using white beans, kidney beans, garbanzo beans, black beans and azuki beans. It’s all out there folks. If you’re on a gluten-free diet, you probably know this secret by now. The Yellow Cake came out firm while the Healthy Chocolate Cake came out moist and soft. The big difference between the two was that the Yellow Cake has the addition of coconut flour and that is probably what contributed to the firmer texture. I’ll review the Yellow Cake first. I followed Lauren’s recipe instructions and everything came together quite easily. Here is what the batter for the Yellow Cake looked like – a firm batter, easy to scoop into the muffin cups. … and had a nice dense texture when cut in half. It was difficult to peel away the paper from the muffins without having thick crumbs still adhering to the paper. I thought it was because I did not spray the paper liners with oil spray as recommended in Lauren’s recipe but then I saw that in her photo, the paper liner also had crumbs stuck to it, so obviously the oil spray did not make a difference. After taking a bite, I could taste the erythritol (I now think it was the baking powder or baking soda and not the erythritol but it goes away after at least 2 days) so I decided to make a topping. Since I did not have xylitol for the topping recipe she had (a comment was made that erythritol did not produce the same results), I decided to make a ganache using a chocolate with 81% cocoa content. Here’s what the end result looked like. I left the muffins in a tupperware box on the kitchen counter for the first two days and put the rest later into the fridge. They were still moist and did not harden up. I even froze a couple and defrosted them later with no problems. At the end of 6 days, I hardly noticed the erythritol aftertaste. These are absolutely fabulous! When I discovered I needed very little insulin per muffin I was in seventh heaven. I had a hard time limiting myself to one muffin a day. The Healthy Chocolate Cake was quite different. I didn’t have black beans so I just used white beans. The batter was very liquid. I thought I’d done something wrong, re-read the instructions but found that all the ingredients called for had been added. So I scooped the batter into the muffin cups and put the tray into the oven. There was still leftover batter so I decided to experiment. This time I buttered the insides of the second tray generously and sprinkled on some almond meal, hoping that the muffins would pop out easily. Boy, was I wrong. I had to pry the cooked muffins apart causing the base to tear – not a pretty sight. Even the muffins in the paper liners weren’t any better. The cooked muffin stuck to the paper meaning a lot of lost cake! Then I took the taste test. The chocolate muffin was moist, lightly chocolatey but not sweet at all – reminded me of devil’s food cake without the sweetness – but the erythritol aftertaste came through. So I decided to make the buttercream frosting which came with Lauren’s recipe – this one used erythritol. I got a light, ‘crunchy’ buttercream – crunchy from what else, the erythritol. The recipe says to grind the erythritol into powder in a grinder which I did but maybe I didn’t grind it long enough. Anyway it still tasted good and paired together, the muffin tasted great. After a few days, the muffins, left on the kitchen counter in a tupperware box, were still moist. Today, about 5 days later, I had the last muffin and honestly, I didn’t notice the erythritol aftertaste nor the crunchy erythritol in the icing. This icing is much lighter than my ganache topping. I savoured my last muffin. Here is a photo of the last two muffins – one with topping and one without. I’m keeping these recipes and next time I will make these into cakes so that I don’t loose any cake when peeling off the muffin paper liners. I will also make these a few days before serving so that any erythritol problems dissolve! If you would like to try these recipes, click on the links above. The nutritional information is also given there. After reading in several places that coconut flour is high in fibre and fairly high in protein, low in digestible carbohydrates and therefore well-suited to a low carb diet, I finally took the step and ordered a packet from an online shop. What exactly is coconut flour? Well, I searched the internet and found different explanations. One site (a distributor) said that coconut flour is the finely ground up fibre left from the coconut after it has been extracted for coconut oil. Another distributor site said that coconut flour is made from coconut meat that is dried, defatted and finely ground. The third site said that coconut flour is made from the by-product of extracting coconut milk! Well, whatever it is, it all boils down to the same thing. The leftover residue – in all 3 cases, the fibrous part – is ground into a fine flour. Good way to recycle the leftovers and make more money! The first thing I made with my coconut flour was a pizza. Pizza is a food that sends my blood sugar rocketing sky high really fast. Who would think that such a thin dough could wreak such havoc? For me, it’s a lot worse than pasta. 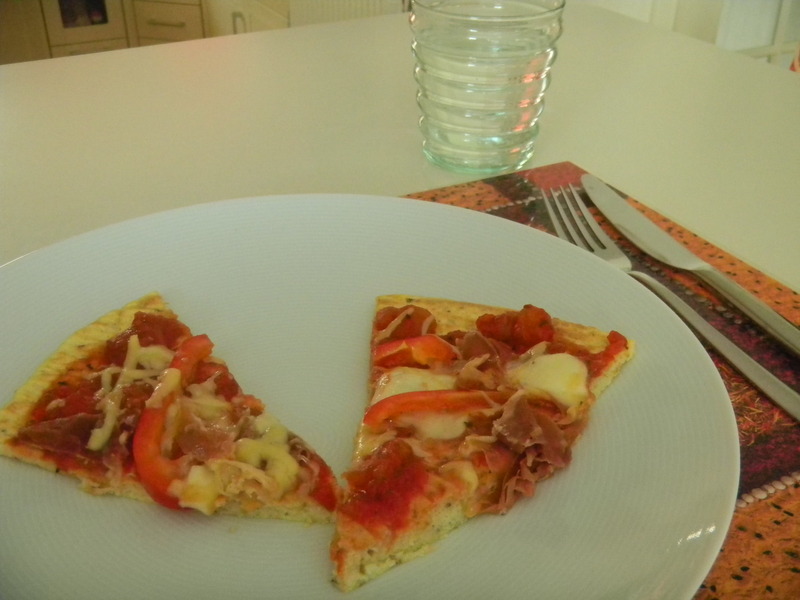 Since I was alone for lunch today, I decided I would try the pizza recipe found in Tropical Tradition’s recipe collection here. This is my third attempt at making a low carb pizza. The first recipe I tried some time back, called for whey protein powder and eggs as the main ingredients and the second used grated zucchini and cheese. Attempt #1 was so-la-la. Actually come to think of it, I think I threw the recipe away! It was that great. The zucchini pizza was nice but it wasn’t like how I wanted my pizza to be. This third recipe produced a firmer pizza base and I could actually hold up a slice of pizza in my hand. However, the taste still wasn’t quite right but I guess that’s personal. The other reviewers all thought it was great. The pizza had a slightly coconutty taste but then, I am using coconut flour so I suppose I can’t expect my pizza to taste like those from an italian pizzeria! The pizza was hard to swallow. It seems like it absorbs more liquid in your mouth (ie. your saliva!) and clumps in your throat when swallowing. The pizza was really filling. I ate half and I was stuffed. Eating one-third would probably be my portion size without a side salad or just a quarter, accompanied by a small salad. I’ve decided to post the recipe here although I am not 100% satisfied with the taste, for three reasons. Firstly, I had a good post-priandal blood sugar reading and I took a lot less insulin than I normally would take for a regular pizza. So, thumbs up here. Secondly, it is so easy to whip up. No need to wait one hour for the yeast dough to rise. Hooray! I whipped this batter up in the time it took for my oven to heat up. Thirdly, if I don’t find anything better, I’ll work on this. Maybe you would like to take it on where I left off and share you experience too. I spread out the batter to fill about 2/3 of my baking sheet. It looked thin but I think the batter rose while cooking and became thicker. The final result was a cooked pizza base about 3/4 cm or 1/4 inch thick. I think if the pizza base were thinner (ie. spread the batter out to cover the whole baking sheet), it would not have clumped so much in my throat. Another solution would be to add one more egg to the batter. Coconut flour absorbs liquid like crazy hence the high egg content in the recipes you find out there on the web. The recipe posted here was altered from the original. I did not have milk nor coconut milk on hand so I used soya milk. I also did not have dried basil. Put the dried ingredients into a mixing bowl and whisk to mix. Add the soya milk, eggs and garlic and whisk till well mixed. Don’t panic if the batter looks liquidy. Wait a while and the coconut flour will soak up the liquid. The resulting batter should be thick but not like a pancake batter which is pourable. You want to be able to spread it and yet have it keep its form. Turn out the batter onto a baking sheet lined with parchment paper. You must use parchment otherwise you’ll be truly sorry! Spread out the batter into the pizza shape you want – round, oval or rectangular. I found there was too much batter to make a perfect round pizza on my baking sheet. I didn’t want the base too thick. Bake 20 min in the oven. When done, take out the pizza, turn it over onto a large plate or cutting board, peel off the parchment and put the pizza top-side down back onto the parchment on the baking sheet, so that the bottom is now facing up. You’ll see that the bottom is nicely browned. Be careful not to break the pizza when flipping over as it is slightly soft. Top with your usual pizza toppings and bake for another 5-10 min or till the cheese has melted. I did a quick carbohydrate calculation on my regular pizza dough recipe and I got 199gr carbohydrates (using 2 cups white flour)!